So, every year I set myself various challenges. This I do primarily to stop myself from getting bored and also to give myself something to do in between writing, reading, teaching and dancing. This year, as readers of this blog will know, I’ve decided to learn Italian. Step 1: Come down from my crazy Christmas high which was created by spending way too much time with fantastic friends, eating great food and generally imbibing outrageous quantities of mulled spirits. Step 2: Run around the house screaming in panic as I realise I’ve set myself yet another insane challenge. Step 3: Take several deep breaths of lavender aroma therapy oil then trawl through the internet to find a site to help me complete my challenge. Incredibly, I first read this book 19 years ago. 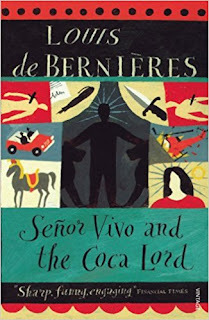 The main reason I felt the need to revisit Señor Vivo & The Coca Lord is because I was recently asked who my favourite literary couple is. Anica Morena and Dionisio Vivo instantly came to mind. The first time I read this book I vividly remember reading a particularly dramatic moment while on the bus and bursting into tears. A man came over to console me and was thoroughly disgusted that my outburst was related to fictional characters. I didn’t call him a Philistine, but I thought about it. The Light Fantastic is just that – light. The reading journey is an easy one with plenty of laughs along the way. We are back with our unlikely hero Rincewind and his task of keeping the tourist Twoflower alive. As in the first book (The Colour of Magic), Twoflower makes this job an arduous one for Rincewind as he regularly finds himself in DEATH’s company. Rincewind, though shy of DEATH, often passes closer to HIM than he would like. The Luggage, another favourite of mine, continues to feature heavily and gives excellent value for money. But now other characters enter the story to delight and entertain in a manner so very appropriate to Pratchett. I can now add Cohen The Barbarian to my list of favourite Pratchett characters. His toothless wisdom had me rolling so much in my bus seat on one particular journey that I missed my stop. Every once in a while I feel compelled to reread a book I read years ago. This was indeed so in this instance as I’ve had to read Of Mice and Men so many times during my teaching career that I may possibly know passages off by heart. I’ve also read The Pearl for work. But The Grapes of Wrath is one I myself read when I was at school. It touched me so deeply that I painted a picture relating to it in my after-school Art workshop. I believe I still have that painting knocking about somewhere. Now a book which inspires in that way surely deserves a reread even if it isn’t considered a classic. 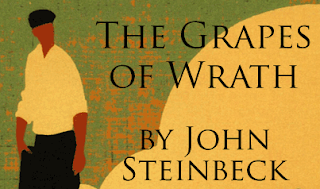 The Grapes of Wrath is as compelling as when I first read it as a teenager. So many quotes kept jumping out at me because they were apt and brilliantly expressed a salient point. To see these please look at this blog’s #amreading page. After starting on the set in September last year, I’m getting through the Game of Thrones series at quite a clip now. This is no doubt due to their intriguing nature and Martin’s writing style which makes reading this collection of books so easy. 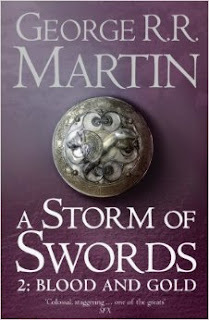 So far, my favourite character in every one of the books in this series is Tyrion Lannister. I find myself rooting for him at every step on his life journey. He works so hard to be a better man despite people’s preconceptions. When he was made The Hand in the previous book I was not at all surprised that he did a good job of it. Tyrion reminds me of some of the talented yet underrated children I’ve taught in the past. Once they were given a task which excited and involved them they relished the challenge and surpassed all expectations. Unlike my students though, Tyrion receives no praise for his efforts and achievements.